Following on from the successful Novo Modern Strings and its recent sequel Forzo Modern Brass, Heavyocity continue to expand their series of themed Novo packs. This third in the series, Synthetic Strings, focuses not on string synthesizers per se, but on synthetic textures inspired by synthesizers and string machines. The Novo engine itself is described in the Novo Modern Strings review (SOS November 2017), so head over to those for the full details. To recap briefly, the Novo Designer engine applies complex modulations and treatments to three independent sound layers. The Loop Designer engine offers similarly complex and convoluted manipulation of three layers of pre-recorded audio loops created (presumably) on the instruments featured in this library. Synthetic Strings (SS) comprises six NKI patches showcasing different aspects of the Novo engine. The first two, Modern Synths and Vintage Synths, furnish the source instruments in their 'natural' states. Ten synths and string machines are represented in total, categorised according to era, each offering a number of variations assignable to eight keyswitches. Envelope, EQ, filter, gate sequencer, arpeggiator, delay and reverb supply additional sound shaping. 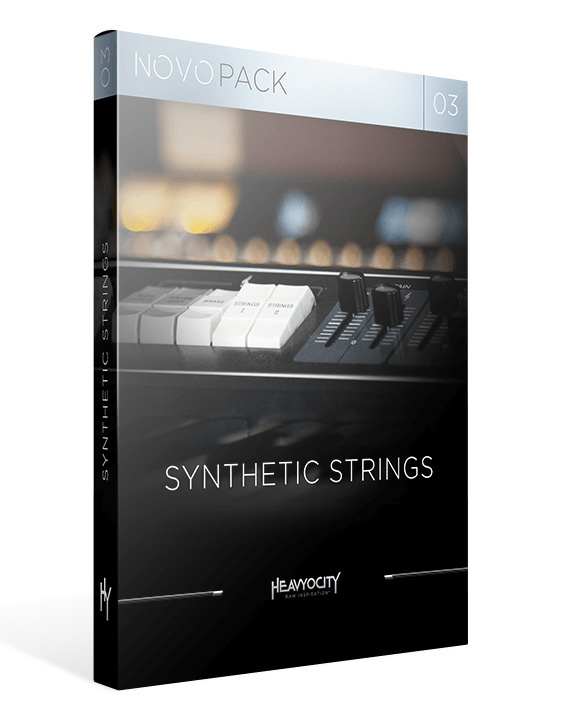 Two Rhythmic Synth patches (straight and triplets) share the same format as the Modern and Vintage patches, delving deeper into the Novo world and drawing from SS's pool of tempo-sync'ed Ambient and Pedal rhythmic audio loops as their sound source. Although the 10 synths sampled for SS are given pseudonyms, the provenance of most seems clear(ish); Juneau 2 is likely to be a Roland Alpha Juno 2 for example; Boomsynth probably a Boom Star, and Analog Brute is surely one of the Arturia synths. It strikes me as a curiously random choice of instruments, however — and if there is one criticism to be made, it's that some of the raw instruments' variations are (subjectively) overly similar, and seem a tad redundant. Given the synthetic strings remit of SS, a few more examples from the vast legacy of iconic and characterful string machines would have made better use of the 12GB hard drive space, and increased the appeal of the raw, playable patches. That said, SS is not really intended to be an anthology of classic string machines — think of it more as a collection of synth sounds geared towards synthetic stringiness. Its true potential becomes apparent when using multiple instances of the Novo engines to create pulsating, ever-changing soundscapes, fully exploiting the modulation possibilities and effects in Synth Designer, and layering all that against beefy rhythmic motifs from the Loop Designer. The results can sound huge, and very deep — the judiciousness lies, as always, in knowing when less is more. Synth-driven scores are common musical currency in sci-fi shows, action movies and spy thrillers. They're even being embraced in period dramas, Versailles and Vanity Fair being two recent examples. 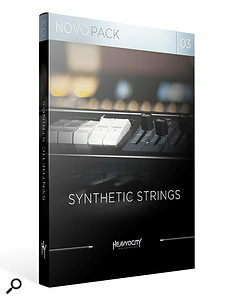 Synthetic Strings is sure to become a go-to resource for many modern scoring composers, and equally indispensable for ambient, techno, post-apocalyptic, industrial, pop and EDM genres.